Espressamente Illy in Pavilion, Kuala Lumpur is one of my favourite place for coffee. And yesterday (Friday the 3rd, 2009), with a personal invitation from Michael, went there to witness a special event. 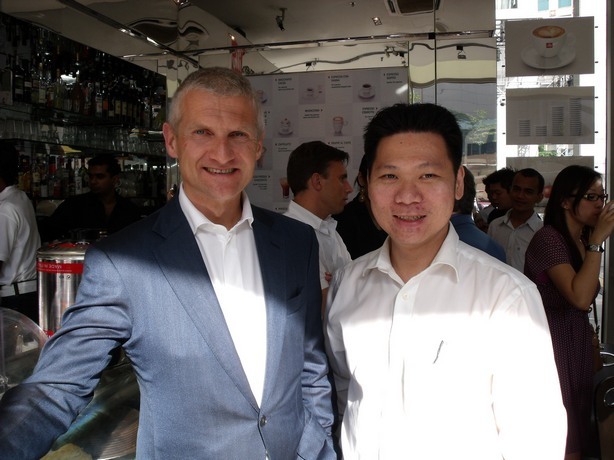 Andrea Illy, the President and CEO of illycaffè was there for a press conference. Founded in 1933 by Francesco Illy, illycaffè produces and sells a unique single blend of premium quality coffee worldwide. Make no mistake, illycaffè as a company has done tremendous job in educating and promoting premuim arabica blend of coffee to the public. Their research facility is probably one of the biggest in the world. They even have a University of Coffee as a training institute. Though among coffee geeks, many tend to whacked them for their apparent lack of freshness in their beans on retail, I can’t really fault them for it. If you want to market worldwide, mass production, storage, international shipping… it is virtually impossible to offer fresh roasted coffee (or anything less than a month). But they did try their best in attempting to preserve freshness. Their 3kg tin of illy coffee apparently has undergone much scientific research to ensure minimal degradation of bean quality. When you first open the 3kg tin, the aroma contained in the pressurised tin can filled the entire cafe for a minute. Brew them on the spot, it is still very decent. But after a day or two, staleness set it. Compare that to a pack of fresh roasted coffee of 2 weeks old, it can last more than a week before staleness set in. If you open a pack of coffee that is 3 days from roasting, it remain fresh for 2 weeks. Mr. Andrea Illy intro them to quite a bit of the history of illycaffè. You should see the reaction of the journalists when Mr. Andrea Illy ask all of them to try some espresso (without sugar?). It was pretty funny. There were distinctively lack of enthusiasm. Hey, I manage to have a short chat with him too. Unfortunately, I don’t have a professional photographer with me. Francis Francis X7 using the iperEspresso System. Suppose to brew you espresso CONVENIENTLY. Looks great but unfortunately, they did not actually demonstrate its capability. Making real and good espresso is NOT CONVENIENT, so I’m really don’t expect great espresso from this machine. But then, CONVENIENCE is a very important factor to many people and I believe it can consistenly brew you something average and not horrible. Believe me, an espresso that is not horrible is better than most espresso you buy in $bucks or any of those major coffee chains. 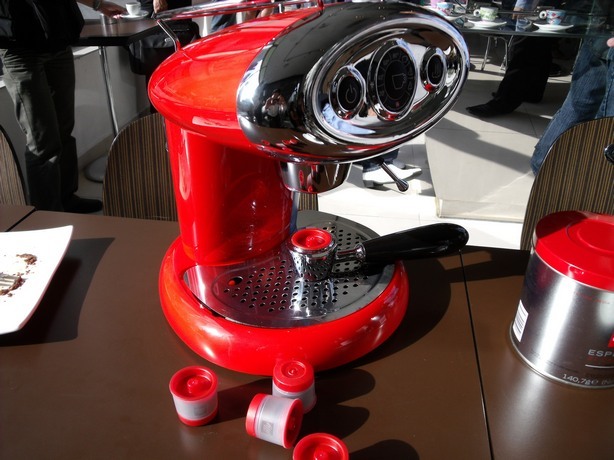 You want a GOOD espresso, either learn to make it yourselves or order one from Espressamente Illy. Here is Meena, Journalist from NSTP. She’s very cheerful, esprecially after a couple of illy espresso shots 🙂 And Michael is putting on his charm. 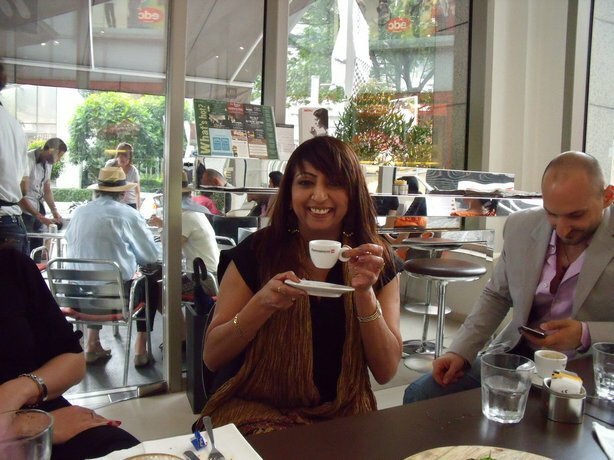 Many cafes in Malaysia offer coffee from illy but not many are good. Though the beans may be from the same source, it is the preparation that makes all the difference. At Espressamente Illy, their baristas were properly trained. They grind their coffee by orders. They adjusted their grinds for optimum extractions and they know how to froth the milk. And they take criticism positively and improve all the time. This entry was posted in Barista, Cafe, Coffee, Coffee Beans, Espressamente, espresso, Espresso Machine, Kuala Lumpur, Malaysia on April 4, 2009 by KF Chan. Yo, mate! 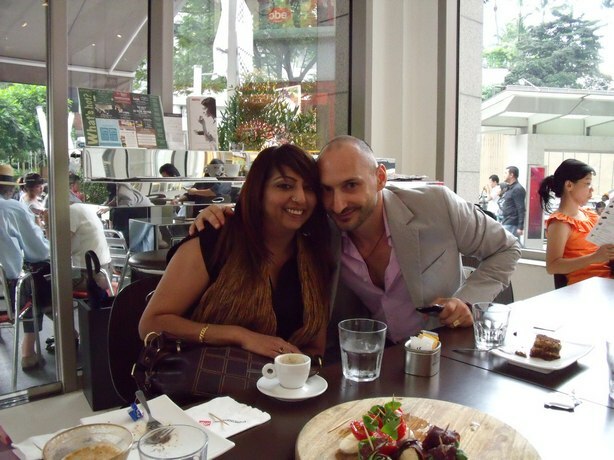 Lucky u, being invited to meet Andrea Illy in person. So knowing the X7, could you give a short summary of the difference between X6 and X7. Is the X6 a good buy? What is the current price for this item? Cannot tell the diff between X7 and X6. They don’t even demo the machine. But I think there is only one reason to get the X7 or X6. CONVENIENT. Using Pod or Capsules, you really limit your opportunity of having many great coffee in the world. In fact, you can’t use anything other than illy pod and capsules. Same story with Nespresso. I think it is not a good investment unless convenience is paramount. Thank for the head-up, KFChan! I am planning in getting a new machine for home use and also entertaining friends but since I am Kota Kinabalu-based, I have to source from some place (esp. KL). I saw one X6 locally priced at 18xxRM and ready to attack it, but since you mentioned that it is limited to Pod or Capsules and not including other brands of coffee, I’ll pass it then. If you are thinking of spending Rm18xx on the X6, I got a way better option for you man. A friend of mine, who just PIDed his 8 months old Silvia is thinking of letting it go for RM22xx. Only about RM400 difference, but I assure you the Silvia is WAYYYY better. It is a BARGAIN man. That is why getting your machine from a reputable dealer is important. I am not promoting any brand actually but rather where they serve decent to great coffee. Personally, I sells Highlander Coffee which is NOT a secret. If you look at this posting : Cafe I Go, out of the 8, I only supply beans to 2 places. There are other places that I supplied beans to where I do not openly recommend because they are not good or consistent enough. Non of them pay me anything for my thoughts and I actually pay for the coffee I drank there. Interestingly, you will notice that lately, I hardly do any review lately. The problem is, if I discover some places that serve bad coffee and I commented so, they will accused me of being paid by their competitors. If I say they serve good coffee, people think I’m being paid to recommend. Well, I suppose that was what happening in the food blogs. Well, we can’t win them all. I am about to run a coffee business in bukitjalil area and i am looking for coffee bean supplier . one of my friends introduce me your company . I would like to know more about your company and your terms . hopefully we can do business together . Where can I buy illy capsules besides at pavillion?